Wow! what an adventure this book is. Currently available as a free download, this book is not to be missed. It has been a long time since I've been on such an adventure. 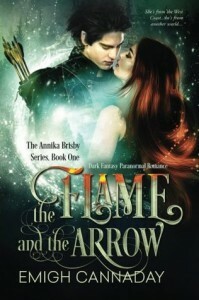 I enjoyed The Flame and the Arrow immensely. Elves, Druids, Fairies, Wood Nymphs, Vampires and of course humans all mixed up with plenty of iffy portals, action, tragedy and loads of romance. The characters are not perfect. Each have their quirks and weaknesses, painting the story in much more realistic hues than most fantasy books. I don't want to give anything away about the story because it must be read to be experienced but I will say that it is about Annika, a girl who never really fit too well in her world, discovering that she has a place in a whole other dimension to fit into and a much bigger role to play. It is a bit of a long book but I still kept dreading that I would reach the end too soon. I think I'm going through withdrawal symptoms because I am itching to get my hands on the next in the series. I am now officially a fan. Free copy provided in exchange for an honest review.